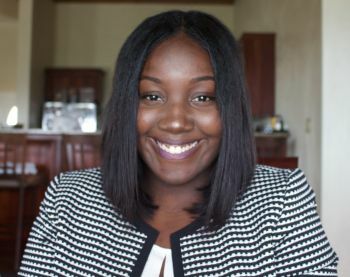 Meet young professional Kyra J. James. This 21 year old is a content producer for Kickin' it w/Kyra (KWK) on Facebook and YouTube. 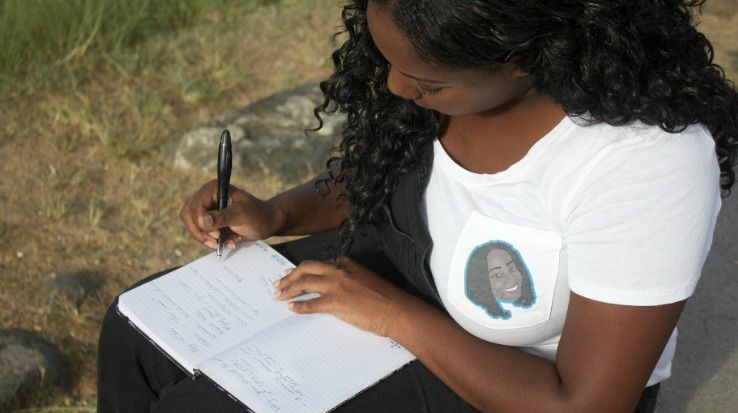 According to Ms James, "I wanted a project that would help me further develop my video editing, web design, and public relations skills, so I created something that forced me to produce content," adding that it began as a 30 day series and when she stopped producing her supporters requested that she continued. Kyra creates weekly content for her Facebook page, Kickin it w/Kyra and her blog site: www.kwkyra.com. "I use my platform to promote the things I am passionate about, and aspire to be a source of inspiration for people of all ages." 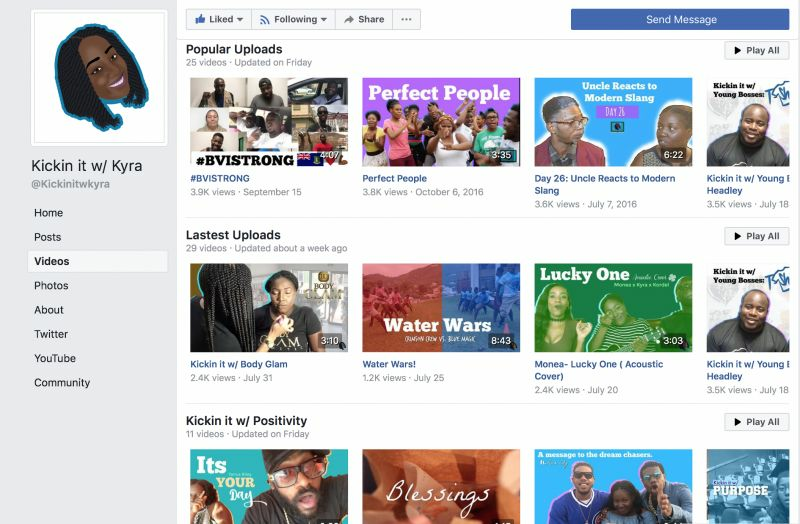 Our young professional disclosed that "positivity" is the main theme for the content in which she publishes, while adding that her mini positive series has supported #BVISTRONG, fed the homeless, encouraged self love and deliver inspirational messages from artistes like Rock City, Pressure and Tarrus Riley. Kyra expressed that she loves to use her platform to showcase local talents and other young creators, while adding that she has done work with artisites like Monea, Brent Hoyte and comedian Kevaughn Watson. "The most enjoyable part about what I do is pressing publish, and seeing the reactions of people who interact with my art. I believe that artists of all forms are among the most influential people on the planet," said Ms James. Meanwhile, on our young professional's website, she stated that she blogs about life lessons, VI culture and "bible stuh-dae" mainly for millennials. 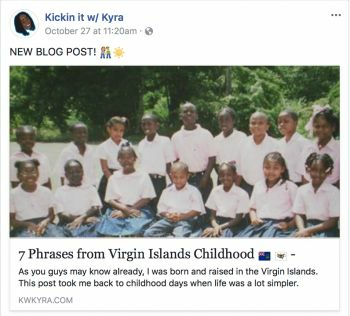 Kyra informed our newsroom that she recently wrote a piece on her blog called "7 Phrases from Virgin Islands Childhood" and it received over 2,000 readers. She said, "People love feeling nostalgic, and reading content that they can relate to just because they’re from the VI. I take pleasure in being a source of that content." She further revealed that she "loves being a creator" because when she creates content it has the power to change moods, perspectives, hearts and minds. "Viewers share my videos and express how it made their day or inspired them to do something. Those responses make what I do fulfilling. When someone approaches me and commends my work, a ‘view’ turns into a human being, and that is an amazing experience." Following the passage of Hurricane Irma, Kyra J. James used her Kickin it w/Kyra Facebook platform to create a video which gave testimonials of what the #BVISTRONG movement means to persons in the community. Kyra J. James is a product of the Virgin Islands educational system. She graduated from Isabella Morris Primary and the Seventh-Day Adventist Secondary School. Ms James is a recent graduate of the University of the Virgin Islands (UVI) with a Bachelor's degree in Communication. In her spare time, Kyra takes pleasure in singing, playing the ukulele, drawing, painting and amateur photography. With every young professional we feature we ask them who they would consider as their role model or inspiration. Ms James said her mother, Petrona N. Davies and Kareem-Nelson Hull are persons that inspire her. Our young professional pointed out that she will use her ability paired with drive for good. "God gives us talents for us to use them for good." "If you're going to put something in the world, let it be positive and let it be genuine. Stay true to yourself and the support will come." Keep reaching for those stars KyKy! I am so proud of you! keeping it kyra. Still a head of the curve. I'm so proud of you Kyra! This young lady is the reason I have been able to reach deep down into by brain and find creativity and self-confidence in myself. I can also say that the BVI is my second home, all thanks to Kyra. Thank you for exposing me to greater things in life. Keep up the good work! happy you are back with Young professional piece VINO hurry back with the cartoon also!!!!! !